Making time for mindfulness is easier than you think. That look babies get when they take their first dip in the pool, or when they touch (or taste) mud for the first time — so adorable, hilarious, and priceless, right? Sometimes we wish we could have that kind of enthusiasm when we wake up to a blaring alarm or eat leftovers for lunch. Babies experience life in a very singular way because they’re pros at mindfulness. They really don’t have a choice — they don’t know how to do anything other than live in the moment. For adults, it’s a different story. How many times have we missed a right turn on the road — and then stressed about it — because we were busy thinking about our Friday night plans? When did we become so desensitized to the taste of that home-cooked meal we get to sit down to with our families? Must have happened sometime during The Walking Dead season. Wanna get back to basics and turn mundane activities into moments of inspiration? Mindfulness meditation is the answer. And no, it doesn’t have to involve setting aside 20 minutes each morning on a yoga mat. It’s simply about being aware of the truth in every moment, so this practice can be built into every little thing we do — even chores we deplore. 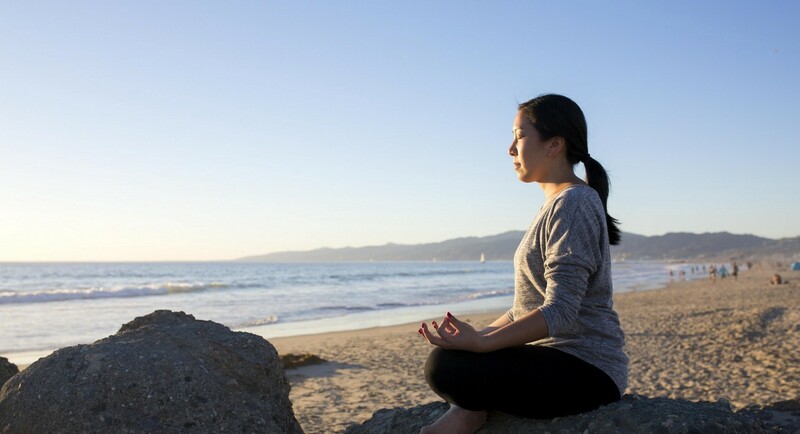 Here are six times to build mindfulness meditation into every day. It can start from the moment you open your eyes. The first thought that enters most people’s heads upon waking: But I don’t wanna! Everything that follows (read: driving in traffic to work, more on that later) can seem like a daunting task we don’t have the energy or motivation to tackle. Set the tone for the day by automatically disengaging from negativity and the stress of what’s to come. Instead, actually open your eyes and ears before you give your brain a chance to start firing on all cylinders. Notice the pretty subtleties of the morning light compared to the midday sun (which we also tend to take for granted). And as cliche as it sounds, actually hearing the birds outside is much more pleasant than resenting the day or cycling through your to-do list, so choose the former. Hopping into the shower, even if it’s just for five minutes, presents a great opportunity to practice mindfulness. Think of all the sensory stimulation going on — warm water against your skin, the sudsy texture of shampoo on your hands and head as you work it through your scalp and hair, the fresh aromas (you can even make a shower more invigorating with essential oils). There’s a lot of good stuff going on here! Take the time to revel in these sensations. Sure we eat for sustenance, but the real reason we do it: food tastes so good. Yet at some point in our lives, when we get really busy, some of us compromise on the pleasure part of eating. (Foodies might be giving that statement the side eye, but it’s true! Remember all the ramen you ate during finals week in college?) It’s time to rekindle a romance with breakfast, lunch, and dinner. Even when you’re not that excited about a basic salad, instead of powering through the plate while skimming the New York Times (or Buzzfeed), see what a difference it makes to actually chew the food and taste it, too. Yes, you can kill two birds with one stone and meditate while doing chores — it not only feels good but can also help you do basic tasks well. In a study conducted at Florida State University, researchers found that out of 51 students who participated in a dishwashing exercise, those who were instructed to mind the scent of the soap and the feel of the warm water and dishes reported a 27 percent decrease in nervousness and a 25 percent increase in mental inspiration, while the control group didn’t note any positive effects. Also, being present with what you’re doing makes it more likely that you’ll get all the crud off those dishes. For city-dwellers, driving can be the most stressful part of the day. (We’ve heard stories here at Thrive HQ of some of the toughest cookies in the office wanting to break down into tears after spending two hours on the freeway to get home.) But this is another activity that can be turned into a meditative experience. And no, we don’t mean spacing out behind the wheel — don’t do that! Mindfulness can occur during driving by just doing what you’re supposed to do on the road: pay attention. Be hyper-conscious of your surroundings — sometimes all there is to look at is a ton of cars. Okay — notice the makes, models, and colors. Focusing on the activity of driving itself, rather than pining for that finish line home, can actually help the time pass faster. Finally, an eight-hour savasana. Lying in bed is clearly the ideal time to meditate. In a study of 49 middle-aged and older adults who were experiencing trouble sleeping, those who were taught to practice mindfulness meditation at bedtime experienced less insomnia, fatigue, and depression than those who were simply instructed on how to improve sleep habits. The technique is as simple as focusing on the breath and letting go of any other thought that has no relevance to the present moment — that means you have a pass to push everything out of your mind and get comfy with the idea of sweet slumber. When tomorrow comes, you’ll be cool and well-rested enough to handle whatever happens. Originally published at thrivemarket.com on November 24, 2015.